Thank you to our facilitator, Marlene. Pre-heat oven to 400ºF. Prepare muffin tray with 12 paper liners. How you cut the rhubarb depends on its thickness, but you want sizeable chunks to get those bites of rhubarb goodness. If it’s slender, I suggest about 3/4″ pieces. If it’s thicker, 1/2″ pieces should be fine. Mix the dry ingredients in a large bowl. Combine the wet ingredients and mix well. Add the wet ingredients to the dry, and stir until just incorporated. Stir in the rhubarb pieces. Scoop the batter into the 12 muffin liners (an ice cream scoop helps you distribute the batter evenly). Bake for 23 to 25 minutes, or until the tops are nicely browned and a toothpick inserted into a muffin comes out clean. Serve warm with butter if you prefer, but these are beautifully moist and good to eat just as they are. Or, serve with some rhubarb compote (see below for a quick “cheater” version). The essence of simplicity, all you need to do to make one cup of rhubarb syrup is chop 2 cups of rhubarb, put it in a pan with 1/2 cup water and from ¼ to ½ cup sugar, and heat over low heat until the rhubarb has cooked down. Press it through a sieve, and voila! You can control the sweetness level by adding the sugar in stages. Start with ¼ cup. 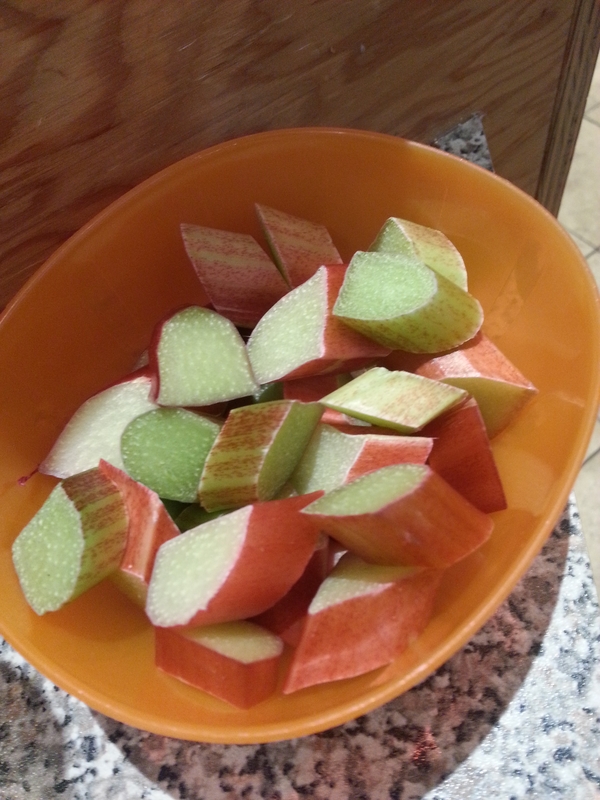 Taste after the rhubarb is cooked down and adjust to your liking. When you make rhubarb syrup, don’t let the pulp go to waste! Instead, add a splash of pure vanilla extract (1/4tsp), and the zest and juice of ½ orange. Stir well, and use as a spread on the muffins or as a topping for ice cream. If you would like to make“regular” rhubarb compote that will be juicier than the “cheater” version above, here’s my recipe. Place the rhubarb, honey and salt in a medium sized pot and let sit for about 30 minutes to extract the juices. Add the orange zest. Bring to a boil, then simmer for 10 or 12 minutes, or until tender. You’re looking for an applesauce-like consistency. Stir in the vanilla extract now. The compote will thicken somewhat as it cools. I took inspiration from this Jamie Oliver recipe to come up with this frittata. Yes, I could have added red chill pepper, or bell pepper and maybe some feta cheese. But you know, sometimes less really is more. Heat the oil in a medium-sized ovenproof skillet over medium heat (my pan is 9-1/2 inches at the top). Add the onions and sauté for a few minutes until they just start to take on some colour. Toss in the asparagus, and continue to fry the vegetables for about five minutes, stirring from time to time and taking care that the onions don’t get too dark. Use a fork to whisk the eggs with the salt and pepper in a small bowl, then pour into the pan. Cook for a couple of minutes, stirring a bit and ensuring the asparagus is fairly evenly distributed. Then put the pan in the pre-heated oven and bake for 15 minutes. When ready, the eggs will be cooked through but still moist. Cut into wedges and serve. 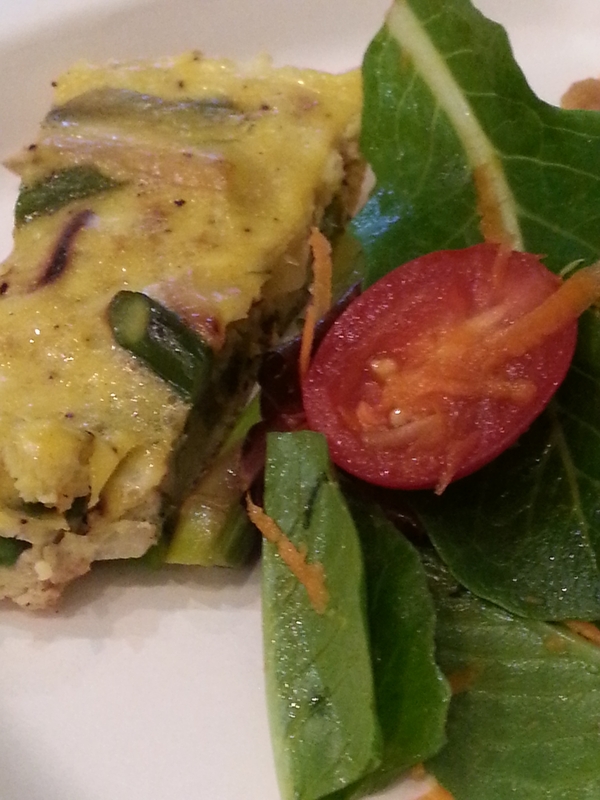 This frittata would be a good choice for breakfast, or for lunch or dinner with a salad. Refrigerate any leftovers and enjoy the next day. Heat the oil over medium heat in a large soup pot. Add the onion and garlic, and cook for several minutes until the onion starts to turn translucent. Avoid browning. Add the celery and asparagus, salt and pepper. Let cook for a few minutes before adding the stock and water. Bring the soup to a boil, then cover and simmer on low for 30 minutes. Stir in the spinach; it will wilt right away. 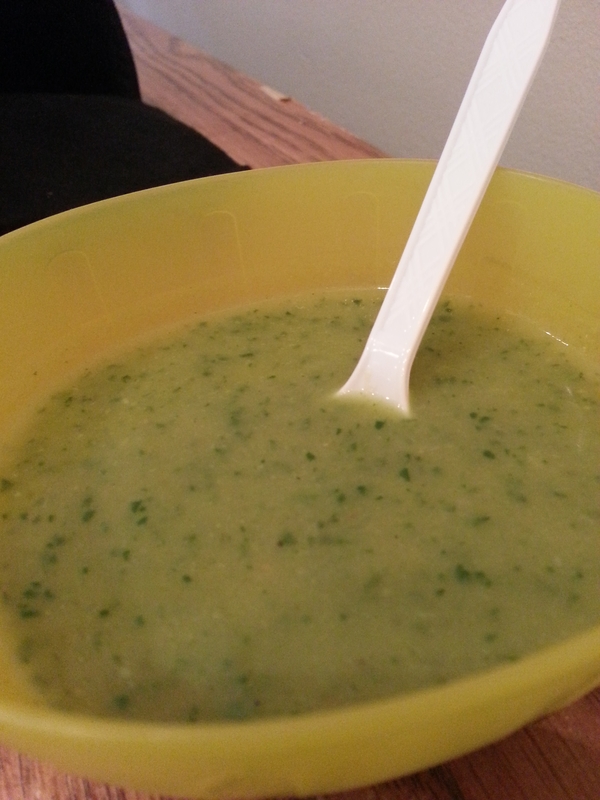 Using an immersion blender, puree until smooth. Taste and adjust the seasonings if required. Roasting or grilling is the only way I prepare asparagus. It’s easy, fresh and flavourful. When roasting in the oven, the temperature and cooking time varies by what else might be in the oven; lower heat, longer cooking time, and vice versa. In this case, I roasted at 400° for about 12 minutes. Hold each asparagus spear near the top and bottom, and snap off the bottom piece. They will naturally break at the border of the tough and tender parts. Rinse and arrange on a parchment paper lined baking tray. Drizzle a tablespoon of olive oil over, then strew the minced garlic among the green spears. Squeeze a lemon half over to also drizzle with citrus. Generously season with freshly ground pepper, then roll the spears gently with your palm to coat them well. About halfway through the roasting time, turn over with tongs. A final spritz of lemon juice at the end adds a nice burst of flavour and acidity. Set aside to cool. For the rest of the salad, there’s really no set recipe; just go with what you have and what you like! That said, here’s a guide. Add a half cup or so of pre-cooked lentils to a shallow salad bowl (preferably the one you used to dress the asparagus, to take advantage of any leftover oil and lemon juice). Season with salt and pepper to taste. Squeeze over the rest of the lemon juice and add a tablespoon or two of extra virgin olive oil. You want this to be on the juicy side so there’s enough to dress the rest of the salad. Add shaved carrot, some quartered and finely sliced cucumber, a chopped tomato, a handful of chopped parsley, and 1-1/2 Romaine lettuce hearts, chopped or 4 handfuls of spring greens. Take advantage of fresh spring produce by adding some baby spinach and thinly sliced radishes. Finally, cut the grilled asparagus into pieces and add to the bowl. Toss the salad gently until well incorporated and everything is lightly dressed, adding more freshly ground pepper to suit your taste. 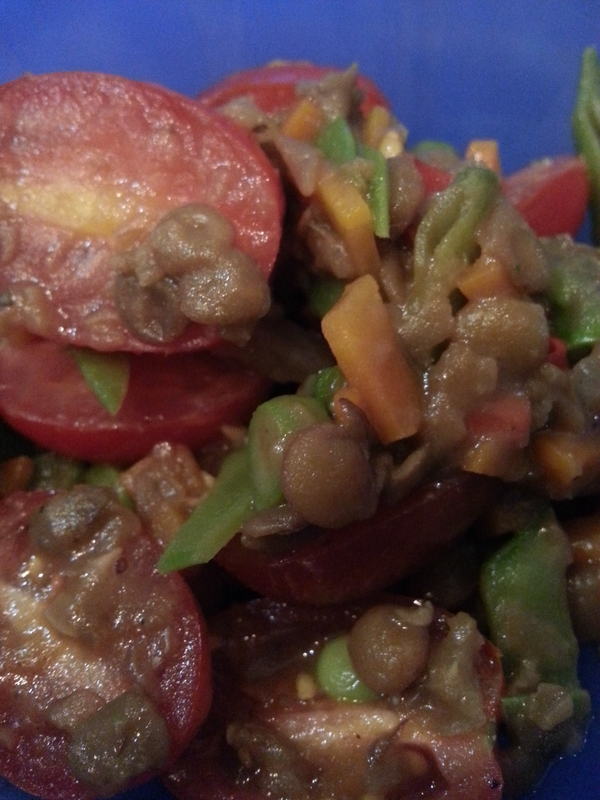 You can use any type of lentil for this recipe except the red ones, which will turn mushy. You want the completed dish to retain the shape and character of each of the ingredients, while melding them harmoniously together.This recipe makes enough for a dinner side dish for two. The vegetables for this dish can vary according to what’s available. In the winter I make it with equal parts carrots, celery and onion with red chili pepper and garlic for accents. For a “primavera” or spring version, green should be the predominant colour. Adding diced raw radish at the end adds brightness and crunchiness for extra spring zing. As you prepare the vegetables, be mindful of how fresh and invigorating their scent is in your kitchen, and the interplay of colours. 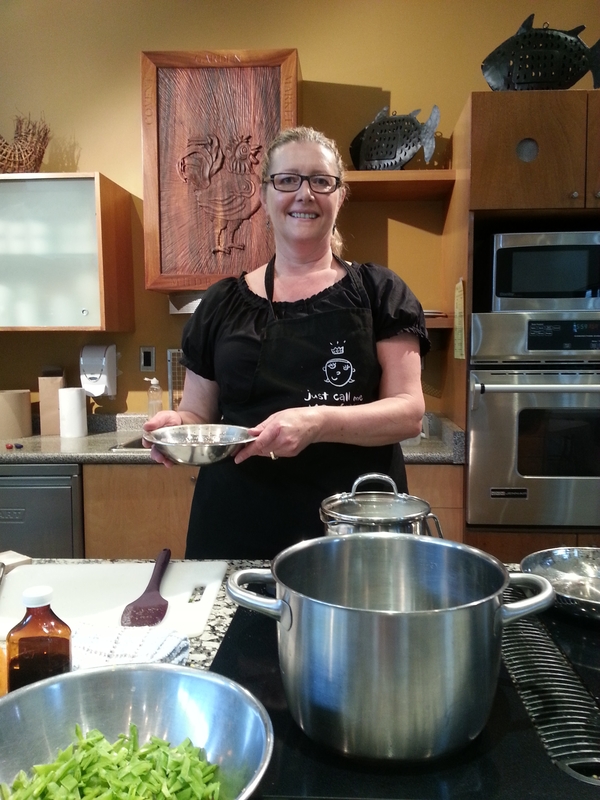 Cooking appeals to so many of our senses, and there’s pleasure to be found in all parts of the experience. Heat the oil in a large skillet over medium heat, and then add the colourful medley of vegetables. Cook, stirring occasionally, until the vegetables start to soften. Turn the heat to low and add the lentils, salt, pepper. Cook for about ten minutes until the lentils are heated through. Splash in the chicken stock and continue to cook, stirring from time to time, until the stock has been absorbed and both the lentils and the vegetables have a pleasing degree of toothsomeness. Stir in the balsamic vinegar and diced radishes, then taste and adjust the seasonings as required. People often mask the tart flavour of rhubarb with lots of sugar. I deliberately let the rhubarb shine in this dish, by using about twice as much rhubarb as strawberries and only a minimal amount of sugar. 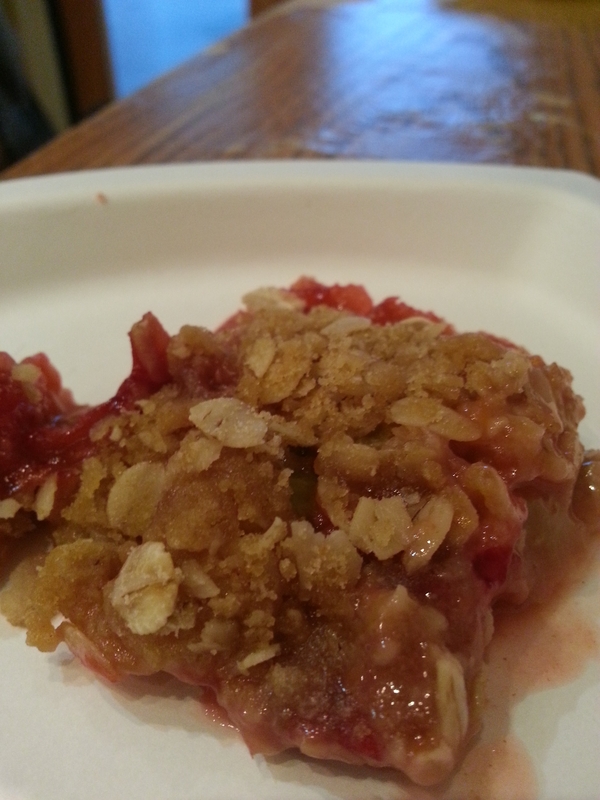 If you like your rhubarb sweeter, increase the sugar to 1/3 cup. Pre-heat oven to 350ºF. Butter 6 ramekins and set on a parchment paper-lined baking tray to make clean-up easy just in case there’s any bubbling over. You could also make this in a single 9-inch serving dish, in which case you may need to increase the cooking time by another 5 minutes or so. If you like a higher crumble-to-fruit ratio, by all means go ahead and make more. Serves six. Toss the rhubarb and strawberries in a large bowl. Add the sugar, ginger, orange zest, and orange juice. Sprinkle the flour across the surface. Stir with a large spoon until everything is evenly distributed. Spoon the luscious fruit filling into the prepared ramekins or pan. I take no issue should you decide you pop a few pieces into your mouth. Combine the sugar, flour and ground ginger in a bowl. Cut in the cold butter with a pastry cutter until the butter is evenly distributed and the mixture is crumbly. Stir in the oatmeal. Using a tablespoon, top the fruit mixture in the ramekins, ensuring each receives an equal allotment of this crunchy goodness. Bake for 35 minutes if using ramekins or 40 minutes if using the 9-inch pan, or until the crumble is golden brown and there’s hot pink volcanic bubbling action. © 2019 Grow Cook Learn . All rights reserved.